The ability to correctly prune shrubs and decorative trees at the right time of year is a landscape maintenance practice that distinguishes the skilled from the unskilled, the professional with a pair of hand pruners from the hack with a set of shears. Acer palmatum ‘Waterfall’ without the waterfall. Japanese maples often fall victim to the hands of the unskilled. 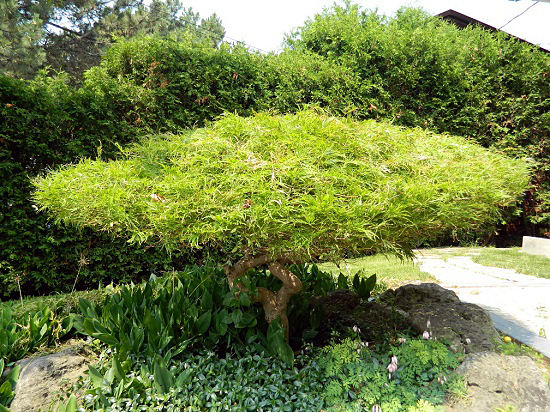 The desire for “natural” pruning is expressed by many of our landscape maintenance clients, and requires an understanding of selective pruning and which tools to use. Our maintenance leads and team members are expected to know correct basic pruning techniques. As we’ve mentioned before, continuing education is very important to us. Since early January, our head maintenance lead Josh has attended UW Botanic Garden’s Master Pruner Series for landscape professionals taught by PlantAmenesty’s founder Cass Turnbull. Each of the twelve lectures provides information on tools and techniques for pruning with better long-term results and customer satisfaction. The right way to prune roses. The “how-to’s” for making good cuts, structural pruning for trees of any age, pruning standards and crown restoration. Pruning and creative solutions for the overgrown or overplanted landscape. Pruning techniques and corrective pruning for commonly planted plants such as Rhododendron, Hydrangea, Callicarpa, Viburnum and Abelia. Vine pruning of ornamental vines: wisteria, clematis, Boston ivy, Virginia creeper, honeysuckle and trumpet vine. Specialized pruning techniques for Japanese maples, bamboo, cloud pruning of pines and tamamono shearing. In addition to attending the lectures, Josh will attend three hands-on, all-day workshops to put theory to practice. Once these pruning workshops are complete, he’ll receive a Master Pruner certificate. Please help us root Josh on as he continues this training!